I've covered morse code jewelry before. They are a good alternative to having visible words. Rather like a secret message. So here is one for the beaders! 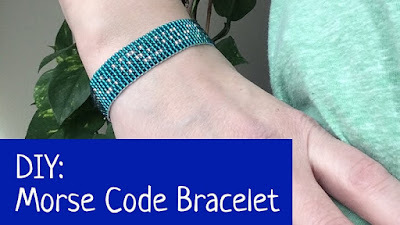 This loom beaded morse code bracelet tutorial is by Kerrie Lee of Dream Up Art. Her blog post has all the written instructions which accompanies her video. Even if you aren't interested in morse code, she shows how to add a button and loop closure for this style of bracelet. She uses a morse code translator program - you could also use charts which I linked to in my own tutorial below. But what she takes the time to show is how to calculate the number of beads for the bracelet so that the coded word she wanted for her design, is centered.